By the time they find Paleo, most people have at least one or two “failed” diets under their belt, often with the rebound weight to prove it. If that’s your history, how do you know Paleo won’t just be another short-term “diet” that you can only really stick with for a couple weeks? Well, first of all, stop thinking about “failing” diets. You didn’t fail a diet. The diet failed you. Yes, you can change yourself to be a healthier eater, but you can also change your diet to be a better fit for your own personality and eating style. Successful diet change isn’t about white-knuckling through a miserable life on willpower alone; it’s about learning from your past failures to make a reasonable plan that doesn’t require any white-knuckling in the first place! Wouldn’t we all like to forget our failures like they never happened? Just sweep them under the rug and start out fresh? Resist that urge: your own failures are your most valuable teachers. Instead of pretending they never happened, treat them as valuable opportunities to learn what doesn’t work for you. 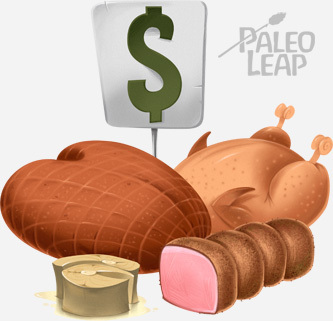 If you’re worried about the cost of Paleo, there are ways to address that besides taking out another mortgage! eggs, and roast chicken interesting). The food was too expensive? (check out Paleo money-saving tips here and here). You got caught in a sticking point? You tried to jump in too fast and got overwhelmed? 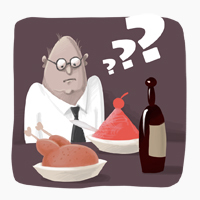 If your answer is any variation on “I didn’t have enough willpower,” don’t stop there. Instead, fill in the blank: “I didn’t have enough willpower to deal with __________________.” The blank is the real answer, not “willpower.” That’s what you really need to address. Successful lifestyle change is not about “having more willpower,” and even if it were, you’re not going to get more willpower by beating yourself up for not having it (if anything, the stress and negative emotions increase cravings for junk food). Instead of banging your head against the willpower wall, think about what specific situation or problem overwhelmed your willpower in the past. What specifically was the problem that caused you to fail, and what specifically can you do to make sure that same thing doesn’t trip you up again? If you’re going to make it work this time, you need a specific plan; you can’t just ignore it and hope it won’t happen again! For example, let’s say your problem was that you couldn’t find a way to eat healthy and enjoy a good social life at the same time. You felt too deprived not being able to go out and eat with your friends – so understandably you chose to have a life you could enjoy and gave up on the diet. Wanting to enjoy social time with your friends isn’t a lack of “willpower;” it’s a perfectly normal desire and a diet that deprives you of that is making unreasonable demands on your life. Instead of trying to bull your way through the loneliness and isolation with “willpower,” think of what you could do to solve or avoid the problem in the first place. Maybe proactively make arrangements to do things that don’t revolve around food, plan to host a dinner party instead of going out, or search out restaurants that serve Paleo-friendly meals. If you keep doing what you’ve always done, you’ll keep seeing the results you’ve always seen. If you want to stop getting tripped up by the same old problems, you have to find a way to address them head-on. Yes, it really stinks having to remind yourself of all the times you did things that you weren’t proud of, but there’s just no easy way out. Last time I tried to eat better, I failed because ___________________________. This time, I will address that problem by ______________________________. …But Then let the Past Go. Learning from the past doesn’t mean dwelling on it, or getting completely caught up in identifying as someone who “fails diets” or “can’t lose weight.” It means figuring out what made you that person before, and how you can make yourself into a different person this time around. This is actually notoriously hard to do – just to take one example, people who lose a lot of weight very often struggle with understanding themselves as a thin person. It’s all to easy to get stuck in a feedback loop of “I made one mistake, so I’m obviously about to fail just like I’ve always done, because I’m just a failure at [whatever you’re trying to change].” That’s not true: you’re doing things differently this time because you’ve addressed the reasons why you failed before. Your choice to learn from your mistakes was already a step towards being different person, and every single healthy choice takes you further along that road; it just takes you a while for that identity to sink in. If you’re worried about getting stuck in the past, make a plan for working through those feelings: journaling might help, or talking to someone who’s been down the same road and can help you figure it out. Too many people “fail” diet after diet because they keep trying basically the same thing: they head into a plan that doesn’t work for their life, try to bull through with willpower alone, get overwhelmed, quit, blame themselves for “not having enough willpower,” and regain all the weight (often with some to spare). Don’t do that. Instead, think about what stopped other diets from working for you, and find a way to change that so you have a diet that doesn’t require so much willpower in the first place. Successful lifestyle changes rely as little as possible on willpower. That doesn’t mean that they’re always easy, or that they require no effort at all, but they should minimize willpower whenever possible so you can save it for when you really need it. If you’ve failed at changing your diet or lifestyle before, it’s probably because something about the diet you tried just didn’t work for your life. If you want to do it right this time, think back on those problems and make a plan for addressing them head-on this time so they won’t keep you caught up in the same old cycle.